I first saw a blanket like this at a baby shower for a friend's first baby boy. Our mutual friend, Joyce, gifted it and I was so amazed she had made it! I hadn't seen anything like it and thought it had such a beautiful vintage feel. 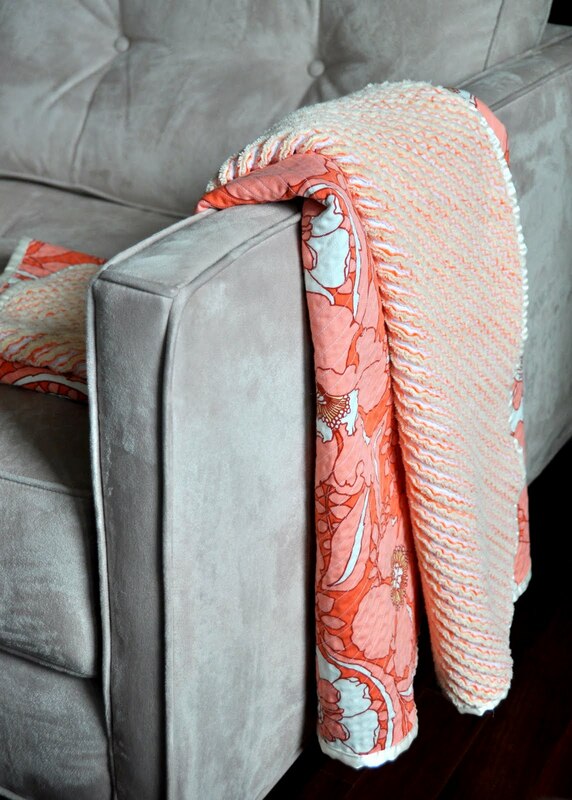 As I was composing my nesting list I thought about including a cut chenille blanket like this. It seems like something that would be a treasured heirloom. I was lucky enough to run into Joyce a couple months ago and ask her a few questions about the blanket and then I dove in. I chose Amy Butler's home decor fabric, August Fields, in Tangerine/Wild Poppies. I LOVE this fabric! I have been thinking about it for months and wishing to come up with something to make with it. An August baby girl is the perfect opportunity... And these tangerine/coral/peachy tones look so beautiful with the linen and lavender I've picked for her crib bedding and eventual nursery. I couldn't find a tutorial online for a blanket like this so I've created one here (click below to jump). It's a really fun, if time-consuming process. I had to switch from a sewing to a quilting mindset to endure the rows of stitching and wondered if I shouldn't have gone with a 36" square instead, but I think the result is worth the effort. Link to the Tutorial below by clicking on "Read More." 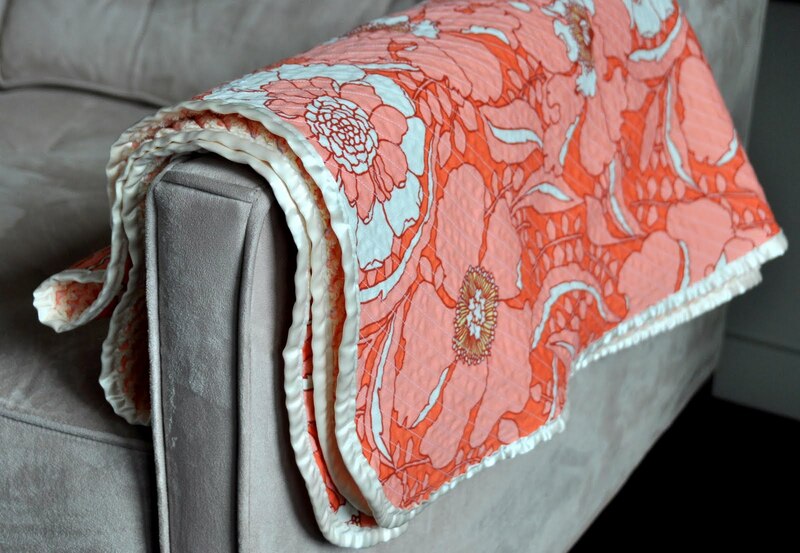 If you make one of these cut chenille blankets I would love to see photos! Please consider adding them to my Flickr Group. UPDATE: If you like this blanket and you want to see my 2011 version, a Chevron Chenille Baby Blanket, click here. 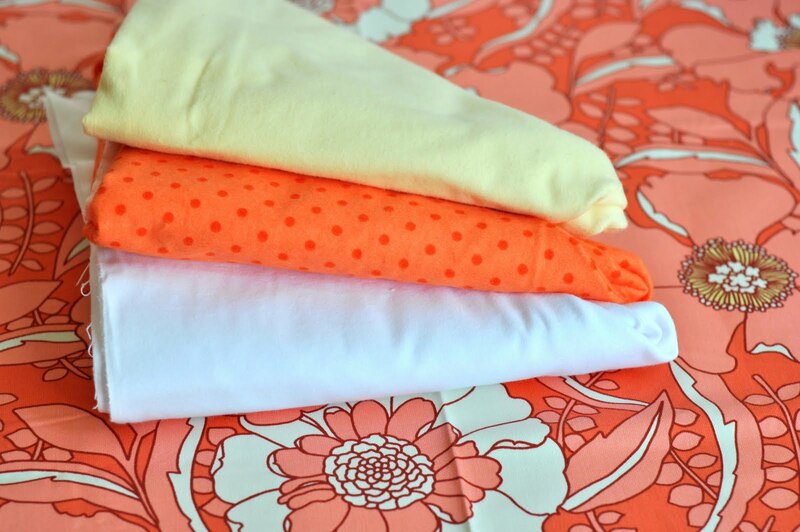 Select three cotton flannel fabrics that coordinate with your primary print. I found this a little tricky as I was shopping locally and didn't find the selection of colors I had in my mind. 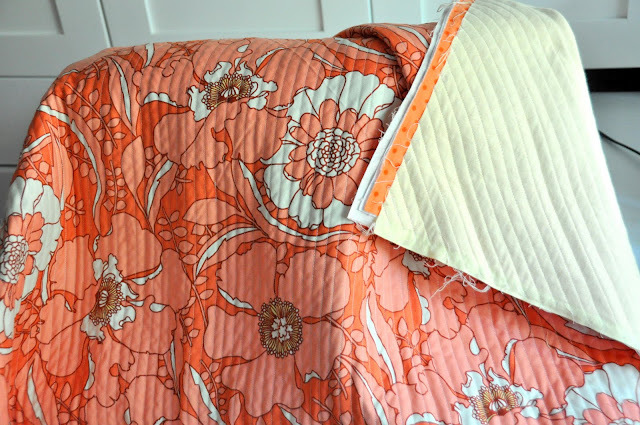 I was thrilled when I found this orangey polka dot--the print doesn't really matter on the flannel as long as the colors work since these fabrics fray to form the chenille. You'll need to cut your primary printed fabric and all three flannel pieces into something close to 45" squares (depending on the width of your fabric), BUT, leave the printed fabric slightly larger to create a margin that will make it easier for cutting the flannel later in the process. About 1/4" will do. Stack your fabrics with the primary printed cotton wrong side up and the flannels on top of it, right sides facing up. Arrange the flannels in the order that appeals to you--I sandwiched my strongest color between white and pale yellow. 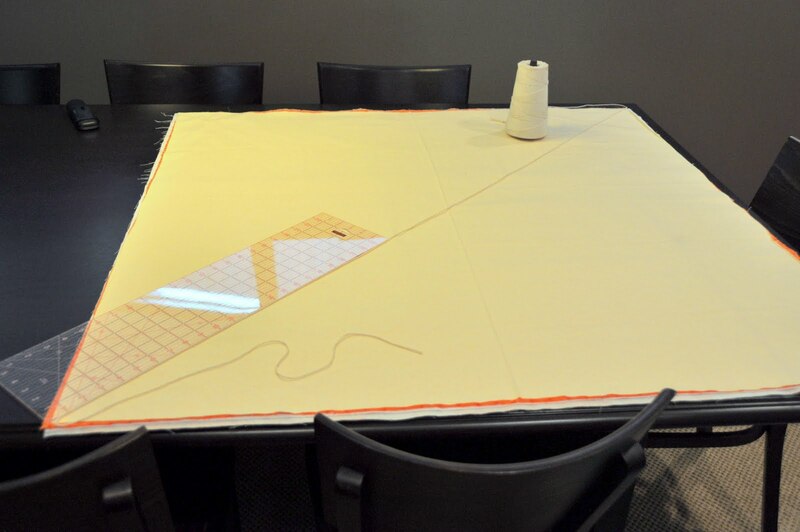 Pin the edges to hold this stack in place, but realize that the quilting process will cause some shifts in the alignment, which is fine. NOTE: YOU MUST SEW AND CUT THE FLANNEL ON THE BIAS FOR IT TO FRAY PROPERLY. To do this, first mark a diagonal line dividing your square in half (into two equal triangles). This will be your first quilting line and all other stitching rows will use this as the guide, so it's important to get it straight and exactly on the diagonal. 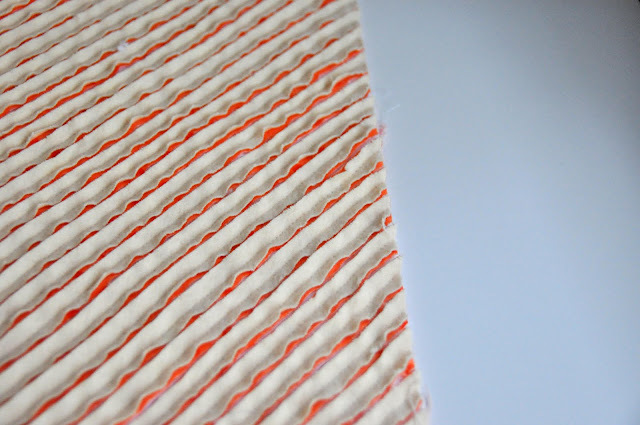 These stitching lines will create "channels" for cutting the flannel chenille on the bias. A bonus is that the diagonal quilting is beautiful! I used kitchen twine pulled taut to find the diagonal line between two corners of my fabric square, then laid down a cutting guide for marking the line with a washable sewing marker. Then the real fun begins: the quilting! Stitch down your center line from corner to corner. 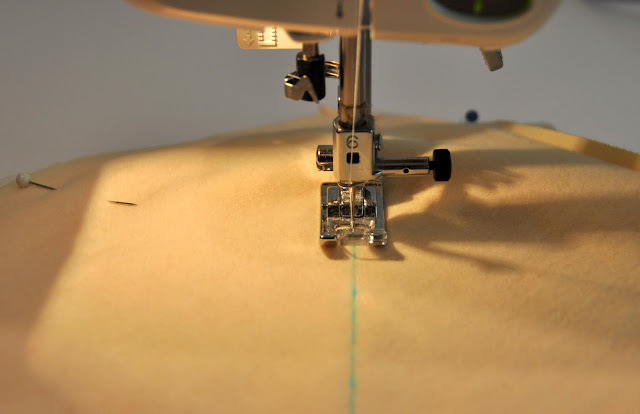 This is where it really is helpful to be able to sew a straight line! But, if the stitching lines aren't perfectly straight that is OK in my mind, because this is a handmade blanket after all. I marked and sewed this first line on the flannel size of the fabric stack. You'll find the fabric doesn't shift around too much, remarkably, which is nice, but by the end your neatly stacked edges will be a little off kilter due to stretching and shifting, but that is easily cleaned up later. Be prepared to spend a few hours stitching. I estimate it took me about four hours to complete all the quilting. As I said above, it helps to think of this as "quilting" rather than the more instant-gratification "sewing." When this step is finished the blanket already looks so beautiful! Note that the edges of the fabric aren't as neatly aligned now. Trim the flannel a bit where it is really uneven (but don't trim the margin on your printed fabric!) to make the chenille-cutting process a bit easier--this really only applies if you are using the Olfa Chenille Cutter. One of the nice things about this project is that it looks pretty fun at each step of the way. I love the look of this cut flannel! After all the flannel is cut, trim the edges of your blanket and "square up" the blanket if needed (fold diagonally and trim excess to make it square). I used a self healing mat, rotary cutter and guide for this but scissors work fine too. 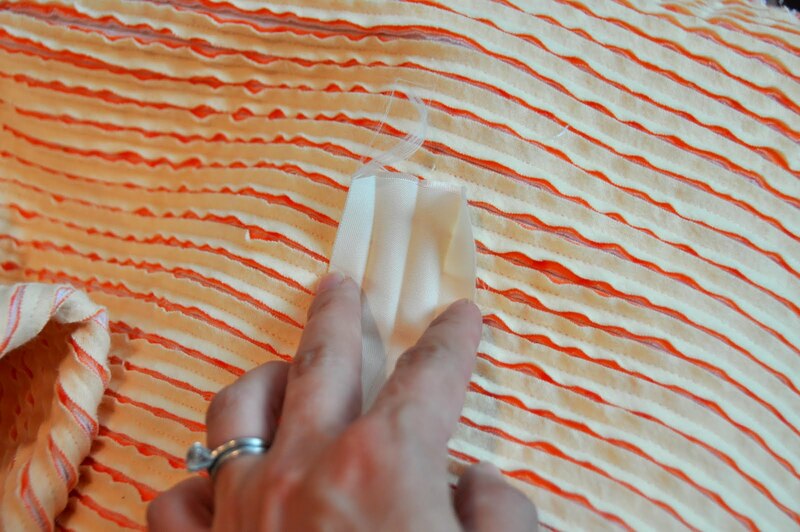 These straight, clean edges are important for binding the blanket. 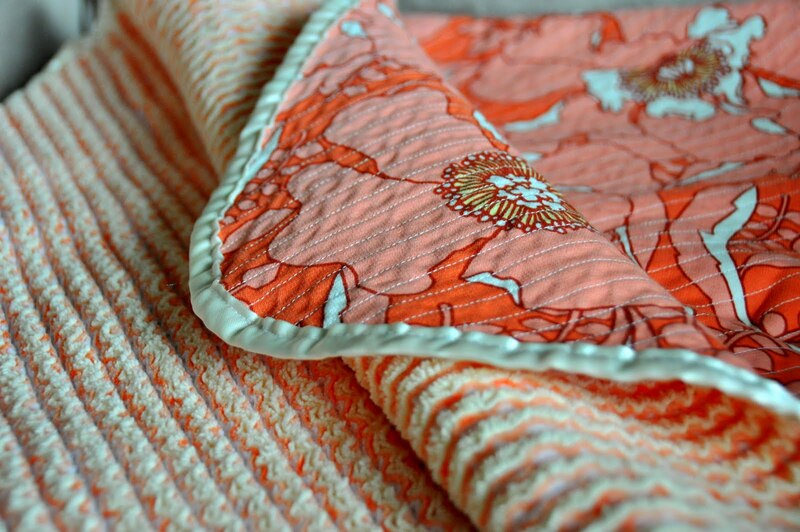 One of the details I love about this blanket are it's rounded corners. To create these use a guide to trim off one of the corners. (I grabbed a small plate with a curve that seemed about right to me but of course there are many handy curve/circle templates out there, I just don't have any in my sewing toolkit.) 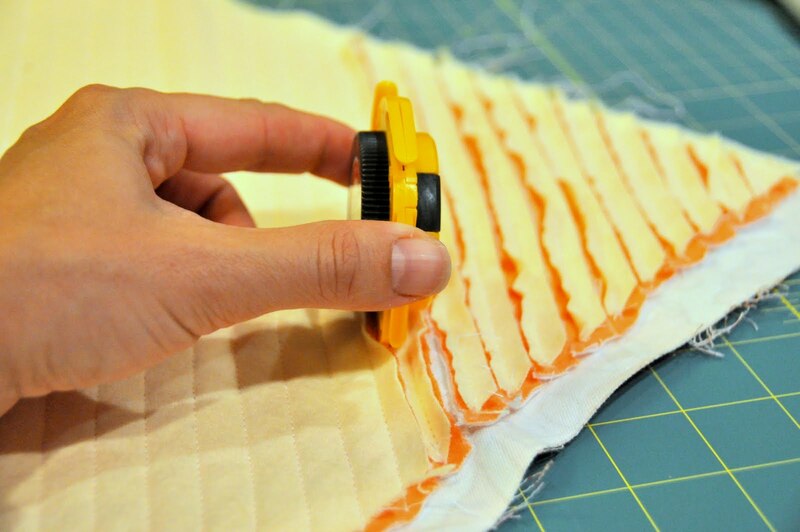 Trace and cut or mark with a washable sewing marker and cut. Use this first rounded corner as the template for the other three so that all four match. Then you need to fold and iron the satin to create the double fold binding. I do this by first folding in half, then opening up and folding the two outside edges inside along the center fold and pressing again. I have to say this was a bit of a pain with the satin. I was really wishing for one of those handing bias tape making tools! I found it easiest to lay down my iron and pull the folded satin under it rather than trying to move the iron along--you might try that, but only if you have a burn-proof ironing board cover! 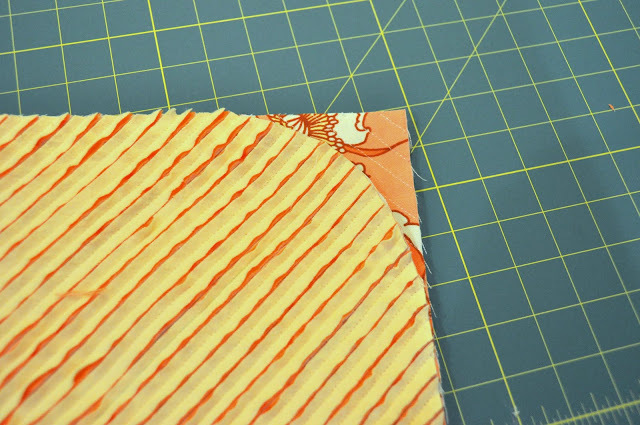 You'll now have a double-fold binding to bind the outside edges of the blanket. Slide the binding over the edge of the blanket to cover the raw edges and pin. 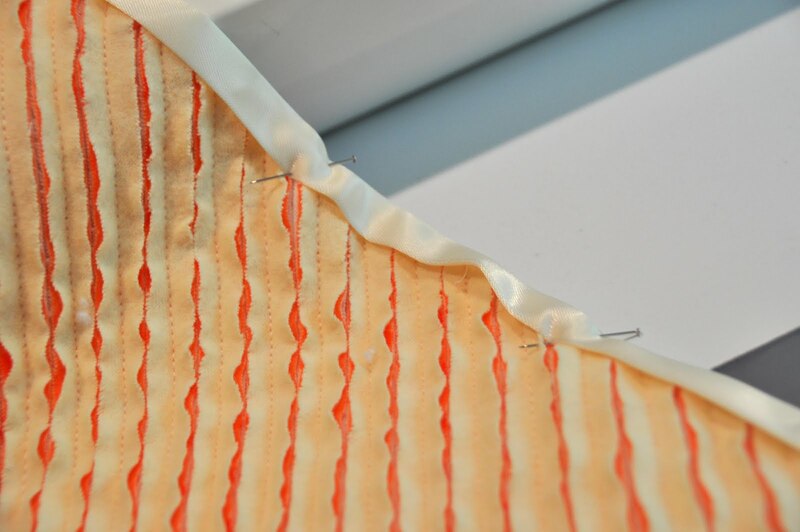 Use more pins on the curves to ease the binding in place. Then top stitch the binding in place, as close to the inside edge of the binding as possible while catching both edges. This is a bit tricky--I wasn't able to get the top stitching line as close to the edge as I would have liked. 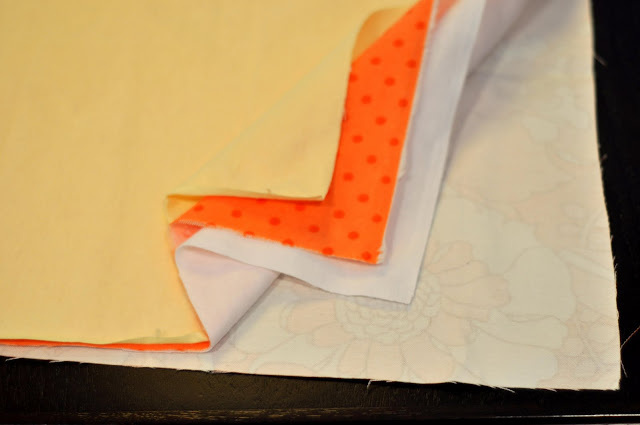 For those true perfectionists, you may want to bind differently by unfolding the binding and sewing right sides together, raw edge even, on the first fold line, then folding the binding over the edge to the other side and either hand sewing or top stitching in place. If top stitching with this method it would still be a bit tricky but perhaps a better result. Here (above) is the nearly finished blanket: quilted, cut, and seam bound. Now you throw it in the wash to fray the flannel and create the chenille. I washed mine on the warm/cold setting with just a little detergent and then threw it in the dryer. Isn't the result amazing? 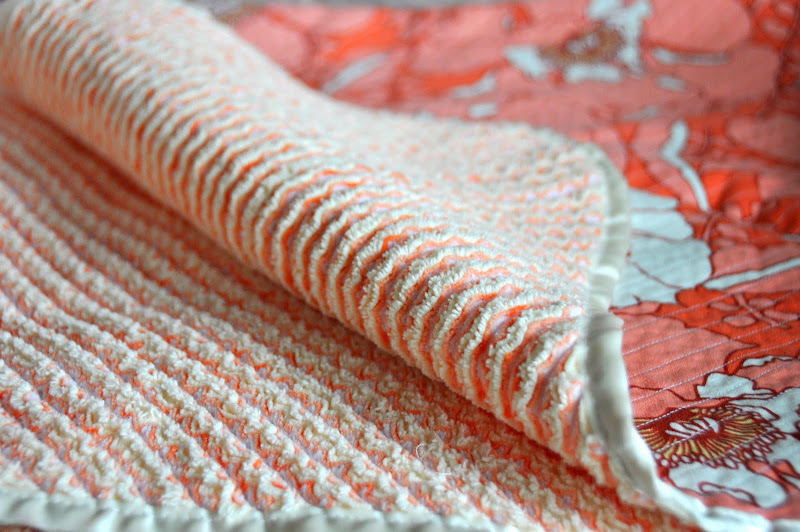 I love those lines of chenille! And I expect they will only get more frayed and fluffy with years of use and washing. @Anonymous: I think it's a great idea to try and rag the edges. I would love to see it if you try it! I fell in love with this blanket and had to make one. I didn't buy a chenille cutter because I am cheap and thought "I'll just use scissors". After finishing the cutting last night I now think I should've gotten the cutter. Oh, how my wrist hurts!!! I also used a high quality quilting fabric but I wish now I had used a cotton with a silkier feel on top that was a little heavier, like the home dec fabric you chose. I am pleased with the outcome. Oh, and I would also cut the fabric about an inch or two bigger on all sides if you are wanting a specific sized blanket. 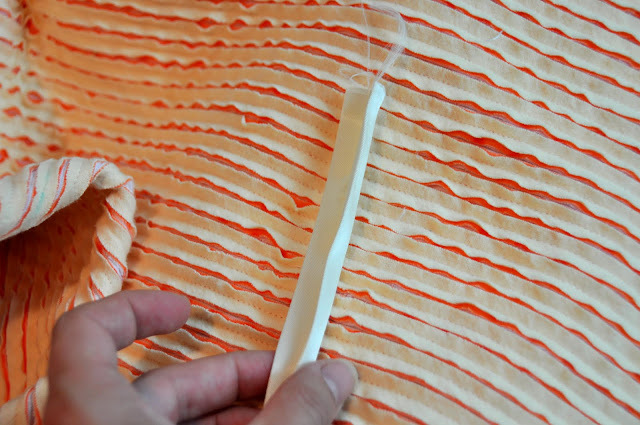 The "quilting" process does cause the fabric to skewer. Happy sewing to all!! Once all these criteria are met, to have fun. Choose rugs that have killed you when you are pink, purple or black, puppies, kittens or tractors. Baby blankets come in such diversity, it is doubtful that many studies to your taste. I recently made a blanket using your pattern/instructions. It was definitely tedious, but well worth the effort! An organic product is presumably one that is without any chemical or fertilizer. A product that is fire retardant may consist of chemical compound. Parents should therefore become acquainted with the composites of the baby mattress pads before it is used by their precious ones. I made one of these for my 7th baby, my fifth boy due in October. But...my flannel got all stringy! I've pulled some of the strings off but it looks bad. What did I do??? Makuahine_4@yahoo.com. Thanks!! Thanks so much for the tutorial! My husband and I made this for a friend's baby. We enjoyed making this and love how it turned out. Here's a link to my post with photos: http://scissorsandspoons.com/cut-chenille-baby-blanket/. We made a couple of changes, but I linked back to your tutorial. Thank you! I just finished mine and it's in the wash right now. I can't wait to see how it turns out! I'm having trouble finding the cutter you suggested... I went to Joann Fabrics and they said they had never heard of it. I just used scissors. I even looked on amazon and couldn't find that exact blade. Any suggestions? @Anonymous: Sounds as if your blanket may not have been sewn and cut on the bias... i will send you an email as well. Thank you very much. I made ​​using the tutorial. Wow!it"s good.I really enjoyed to read this topic. I wanted to let you know that I made one of these blankets. I used an aqua, a yellow, a mint, and a monkey print to make my cousin & his wife a quilt for their second baby. Took me FOREVER to sew and cut the lines (and I did accidentally cut through the front once) but the look on her face was priceless. Want to make this for a friend. Found some gorgeous vintage inspired fabric, but its linen. Do you think that will cause a problem? Its not exactly cheap so I don't want to buy it if you don't think it will work. A large flannel chenille throw is the first project on tap for 2013. I can't wait to make it. 1. 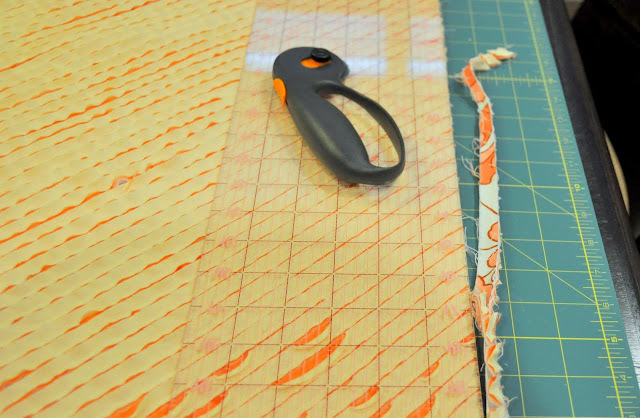 Use the chenille cutter OR an electric scissors. Black & Decker makes an elecric scissors that will make quick work of the cutting. 2. You have to sew the lines and cut ON THE BIAS. 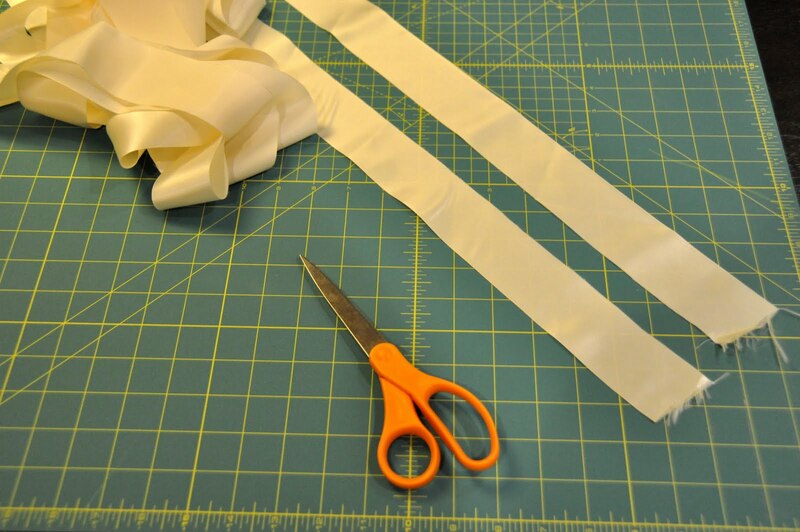 You can NOT sew and cut diagonally on a rectangle. 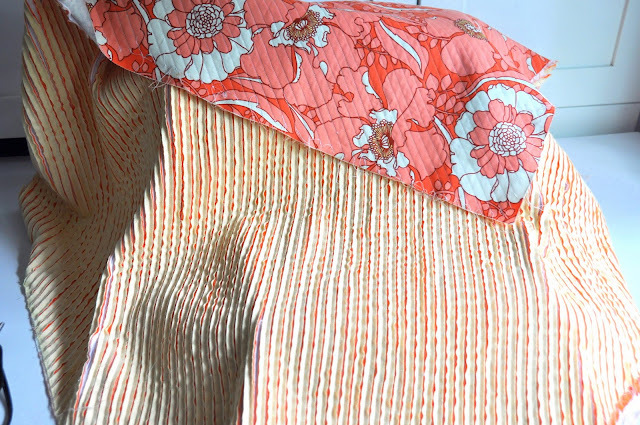 Stringy quilts mean it wasn't sewn or cut on the bias. 3. It helps if the base fabric is 1-2 inches longer on each end than the chenille layers. 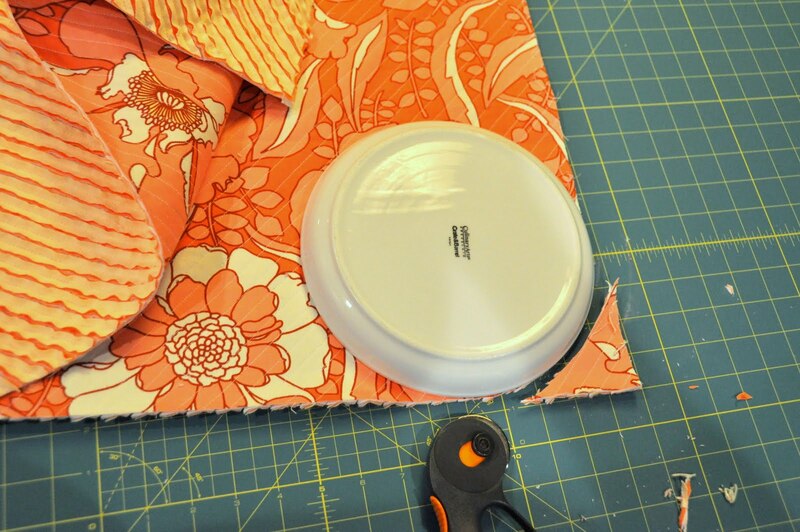 You are less likely to accidentally cut the base fabric. 4. It also helps to take a sharp scissors and cut 2-3 inches of the chenille layers before you start the serious cutting. Again you are less likely to cut the base fabric if you precut the first couple of inches. 5. 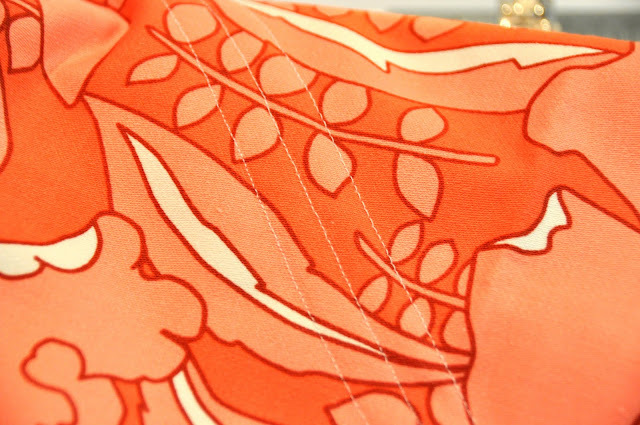 If you have rounded corners, you need to use bias binding. Straight binding doesn't like to go around corners. Bind the throw before you wash it. 6. Don't prewash fabrics. You want them to shrink up and be fuzzier. 7. We strongly recommend taking the throw to a laundromat because of all the lint. Hope this helps! I can't wait to start mine. @Anonymous: Thanks so much for the great summary of tips! I couldn't agree more. Just found this tutorial in my pinterest feed. What an excellent (and beautiful) tutorial. A friend's grandma made one for my daughter back in '05. I went with my friend to pick out the fabrics. It is such an amazing gift. I had wanted to try making one but was never 100% sure the best way to go about it, even though I've quilted for years. With this tute, I'll have no trouble giving it a try. Now, to just get my brother to pop out another niece or nephew for me (or you know, my sister-in-law). I made a blanket using your tutorial for a friend last month and thought I'd share a tip here, too. I couldn't find the chenille cutter locally and couldn't (wouldn't) wait long enough to buy online, so I looked around the house for an alternative cutting tool. I knew using scissors would get tiring REALLY fast. So I used a letter opener. It has a razor blade inside a plastic guard/holder, so it uses the same concept as the Olfa cutter, but was free! The only issue I had was I had to pay attention to keep it in the center of the channel. Otherwise, it zipped through all 3 layers of flannel with no problem. Even in the few places where it strayed from the center, it never got so close to the stitching that I worried it would come apart. After washing, it fluffed up so pretty and soft. Thanks for a great tutorial. I saved this to my pinterest board ages ago. I knew it was something I just had to make one day, and finally that day has come. I can't tell you how annoyed I was getting at myself for sewing less than perfect wonky unparallel lines, and how scared I was when it came to cutting the flannelette (there was more than one occasion that I panicked, thinking I had cut through the top fabric as well), but it all worked out well in the end. I will try to add photos to the flickr pool. I just came across your tutorial from a link from Spoonflower. I made this chenille into a jacket many years ago. I never thought about doing a baby blanket. Thanks so much for the idea. I love your main print. I finally finished this project and I absolutely love it! Thank you so much for posting this. I'm sure the second one will go much faster but the time involved was definitely worth the end result. And next time, I am not doing this without the Chenille cutter. My fingers didn't hurt, but it took a lot longer to cut then it should. Thanks again! Thanks so much for the instructions. I have a tip that worked really well for me. I tried very hard to be careful, but I ended up cutting right through my fabric several times...my scissors had far too sharp a point on them and even though I tried to be careful, I made several holes and slashes. My tip is simple: just flip your scissors over! When I did that, I had no more problems at all. In spite of patching the holes with fusible web and identical fabric, my blanket turned out absolutely beeeeautiful!!! Hello, I featured this tutorial and your blog, in my blog. Someone I don't know made a quilt like this for my daughter when she was born and I've been searching for 6 years for a pattern! I plan on using this pattern A LOT for the multitude of babies that arrive here and there. One question, I'd love to make a larger throw or twin sized version of this and am having a rough time trying to figure out how to size things up when I buy the fabric. I'm assuming I'll have to do some large pieces sewn together and then do the layering, etc. Anyone have any suggestions? 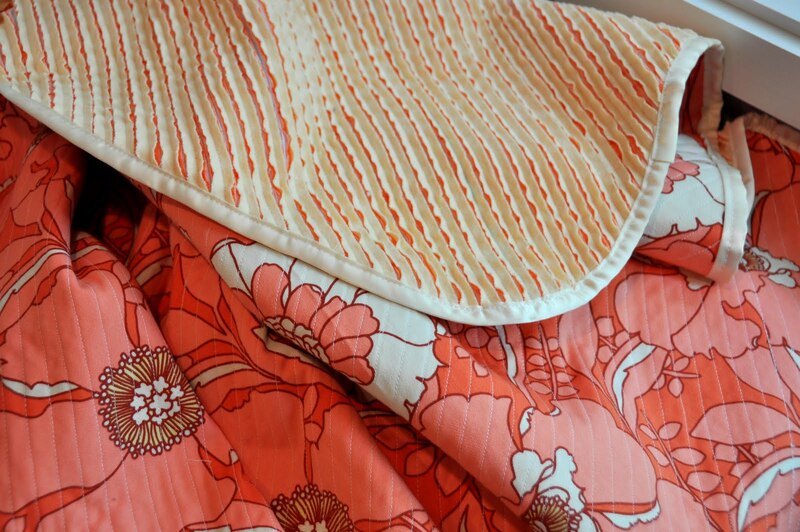 Looping to your sweet baby blanket and am so adding this to my growing list of baby items! I just made mine for my first baby and am planning to make more! I washed mine on cold/cold just to make sure the colors wouldn't bleed. I am working on my second chenille blanket. Thank you so much for the tutorial. It's a lot of work, but I have really enjoyed making them. With 5 new babies in my family and church, This has been a great gift, made with love. I had previously done a small chenille rug with 5 layers of inexpensive quilt fabric. I was very disappointed with the result, but when I saw your blanket, and that I have a baby shower to attend coming up, I was inspired to try again. I am soooo glad I did! I used high end flannels and I'm very pleased with the results. I am not confident in my ability to consistently sew a line at 45 degrees, so I spent a lot of time looking for backing fabric that had a some kind of design that I could follow and actually found a print with a 1/2 grid pattern. Loved it. I did not use "baby" colors, so this blanket can grow with the child. Thanks for such an inspiring tutorial!! It a good idea of sharing on how to make baby blanket as always we want what's best for our babies. Keep it up and a good to share! Hi! I used your wonderful tutorial to make one of these, using all flannel and it turned out AWESOME! Can't wait to give it as a shower gift. Don't know how to send you a picture, but if you want to see it, let me know how to get it to you. I want to try making this for my son but I have never sewn anything on my own so I was wondering if I could get your opinion on whether either of these fabrics would work for this blanket. His theme is Nautical so both fabrics have to do with underwater animals. I love this idea, thank you so much for sharing. My first attempt went a bit wonky so I've tried again but am having a bit of trouble with my stitches. Once I've sewn a line of quilting and take it off the machine then the stitching seems to pull and snap as if it was too tight. I've tried changing the tension and stitch length but have had no luck. Any suggestions please?! Just finished my chenille blanket and it came or AMAZING!!! Thank you so much for posting this. The tutorial and photos were excellent and very easy to follow. WOW! At first I thought..."hey she isn't using any chenille" then I read the whole tutorial and realized that you are MAKING the chenille baking! My next thought was how did she get that color with those lines in it, it is beautiful! Then again read it, and completely understood! I will totally be making on of these! Way to stinkin cute to pass up! I realize this post is like 4 years old, but I just stumbled upon it and it's the perfect thing I've been looking for. Thank you for sharing. Thanks, I think I've got it. I made one of these for my grandson, but I'm making the chevron one for me in white and aqua with teals, pinks, and white for the back. I'm so excited. Thank you! I love his. I teach a girls' sewing class and this will be perfect. Ok can I just say WOW WOW WOW !! I never knew you could make your own !! This is truly fabulous !! I have wanted to make a lap blanket but if you actually find a chenille you like well then it's usually very pricey. Way to pricey for a beginner like myself !! I love this. Thanks so much for sharing !! I just made this and had no shifting problems at all. I marked every 1" (figured I could eyeball the row in between). I sewed every 4 rows apart or so, changed directions every now and then and then went back to complete the other rows. SO much fun. Not hard. Time consuming, but worth it. Thanks for the step by step. After a year of admiring your faux chenille blanket and pinning it on Pinterest, I finally found the guts to try it out as a gift for one of my best friends who's having her baby in July. And let me just say, it's the most beautiful thing I've ever sewn! Thank you so much for the awesome tutorial! It definitely was time consuming, but the results were worth it! Lotsa love was put into it. I uploaded it to your flicker account! It's the yellow and gray one. I made 4 of these in the month between Thanksgiving and Christmas last year for my grands. Each one was 54x45. They love them. Getting ready to make another for the first grand baby next month! Love the pattern. Tyvm. It is really a pretty easy pattern once you start going but I had a hard time figuring out how to write it down. SO, YOU MADE THE CHENILLE -- IT'S JUST FRAYED FLANNEL, RIGHT? THE UN CUT LAYER OF FABRIC LOOKS LIKE A QUILT ON THE OTHER SIDE. It also helps to alternate the direction of your quilting lines..ie sew from right to left one row, next row sew from left to right.. I find if you stitch your diagonal rows alternating the direction that it helps with any shifting. I also left enough of the printed cotton to fold it over the edge and make that the binding..worked great and easy! I press my stitching before I start cutting with chenille cutter to "set" stitches. Love this tutorial !!! Love love love this quilt. I've made two of these and they are beautiful! First one took me 8 hours. Getting better as I go!